What a wonderful way to save money for your next celebration…by making a DIY Pinata yourself. It’s really easy to make, and if you have all the supplies right at home…then why not do it yourself? DIY Pinata Party Ideas! I’ve seen the prices on Pinatas at party stores and other retailers, some of the prices are very expensive! The Pinatas that are relatively cheaper ($35) are either not what you envisioned, are not the right theme, or aren’t aesthetically pleasing. While other pinatas are almost $50 dollars…yeah! I know right!?! For something that is going to be destroyed so your party goers can get the treasures inside, and ultimately end up in the trash. Well I don’t know about you but I do NOT plan on throwing away $50. With my trusty DIYer’s by my side we will create a DIY Pinata before paying that kind of cash for a party game/decoration! DIY Pinatas with cones and streamers! Such a cute idea for soccer! We actually had to tear it open, the kids could not break it!!! Who’s ready to save money and create a kid friendly craft with the kids. This is a great activity to keep the children busy and teach them something in the process. We’re teaching life skills everyday and DIY is definitely going to be in our children’s arsenal of knowledge! 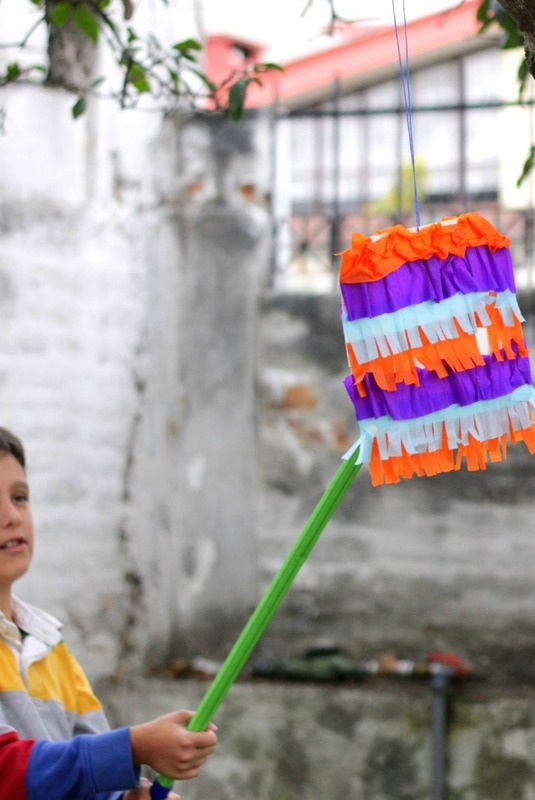 Just following a few easy tasks, you can make a authentic DIY pinata to match any theme! These pinatas are kid tested and mother approved. You can see after 50+ wild children hit this one, it still was in tact which is more than I can say for store bought Pinatas that cost $50-60 dollars. Please leave a comment below and Subscribe to this blog for FREE DIY ideas and updates! Love this! My family has had 3 pinata’s this year alone. We have such fun with them. The neighbor kids come over and it turns into a true fiesta 🙂 So much fun. Thanks Kelly…our kids LOVE them and insist on one every bday! These are so fun and thank you for sharing how to do them with us. thank you this was a great DIY Piñata tutorial project! I love some of these ideas! I do agree that some pinatas are a waste of money! I’ve made a few piñata before. We did paper mache over balloons. One thing I haven’t made yet is a pinata. How fun, and you know the kids will love it! Better to put time into this than fancy decorations they won’t hardly notice.